Jim Henson is and was a very real product of his generation. He, like many of his peers, thought outside the box. They made film, art and music that pushed buttons, made bold statements and pushed you to think in a different way. It comes as no surprise to me, then, that Tale of Sand by Jim Henson and Jerry Juhl was just another excellent exercise in their ongoing quest to push boundaries of thought and expectations into a bold new direction. Thankfully, Archaia Comics, along with the excellent artist Ramon K. Perez, were able to bring this long passed-around Hollywood script to life in this beautiful hardbound tale! Let’s face it: most people are familiar with Henson from his work with The Muppets and his master puppetry work on films like Star Wars, Labyrinth and The Dark Crystal, as well as his multi-Emmy-award-winning work on Sesame Street. Henson has always been about changing your perception by giving you something out of the ordinary and thus catapulting your dreams into a tangible, believable reality. Tale of Sand is very much in that same vein. It is that “fish out of water” constantly trying to get his footing under him. It could have easily been in Jim Henson’s StoryTellers series, and what’s more, it reminds us of his timeless appeal. Tale of Sand starts out simply enough, with a stranger in a strange town who just wants a light. Instead, he gets gets thrown heels-over-head into a crazy chase that leads him face to face with lions jumping out of limos, ladies of the 60’s bathing in the sun next to the pool, the entire Green Bay Packers team, and an unforgettable car chase across the desert. It doesn’t seem to have just one train of thought, and it certainly keeps you guessing as to who or what will show up next! All of this crazy adventure is only accentuated by Ramon K. Perez’s excellent artwork. His lines are smooth and crisp and really do add another level of enjoyment to this book. In many ways it reminds me of Tony Harris’s work on Ex Machina. Forget trying to put any sort of label or time period on this piece, because it doesn’t exist. This could almost be filmed on a crazy back lot in Hollywood with our main character running through different sound stages. It is that crazy and that fun. Tale of Sand, to me, really does express Henson’s sensibilities. He is able, even now, to challenge your thoughts on which way a story should or could go and give you something different and fun – so much so, that I have left out a VERY important part of this review: save for maybe a few lines at the very beginning and a few scattered in like buckshot, it has VERY little dialogue. However, even with its sparse dialogue, it is able to, in large part thanks to Perez, convey volumes upon volumes of words. You feel for our main protagonist as he runs frantically from an assassin taking potshots at him across the barren desert floor. You understand the small pockets of reality and instantly understand what time period these are each referring to. All of this eventually ends, but is it truly ending or just beginning again? You read it and tell me. Final Verdict: While Henson himself may be dead, his works continue to ignite the imagination in ANY form of entertainment. 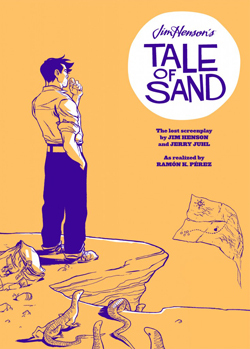 Tale of Sand is a great expression of art in any time period, and proves that Henson and Juhl have created a timeless piece of work that is not only fun to read but, thanks to Perez, amazing to look at as well.